Fifty-four years of marriage has taught Cande and Camilla Hernandez what matters most in life. In the early 1980s the couple constructed a modest house on a 15-acre site near the Blanco River in the Texas Hill Country. They wanted a quiet place in the countryside, but close enough to enjoy the city conveniences offered by San Marcos and Austin. The Hernandezes raised six children here in a loving and lively Christian home. Their only neighbor was the river, a gentle friend that curled past a small stand of cedar and cypress trees within view of their front yard. As they built a lifetime of memories along its banks, the Hernandezes discovered that the river was temperamental. Extended droughts at times reduced it to a dry channel. Then with little or no warning, heavy rains could quickly turn the river into a death trap. Two floods, one in 1998 and another in 2001, carried the Blanco within 10 feet of their front door. But even with their intimate knowledge of the river and its unruly ways, nothing prepared Cande and Camilla for the record-setting 44-foot-high surge of water that overtook dozens of homes, including theirs, during Memorial Day weekend. 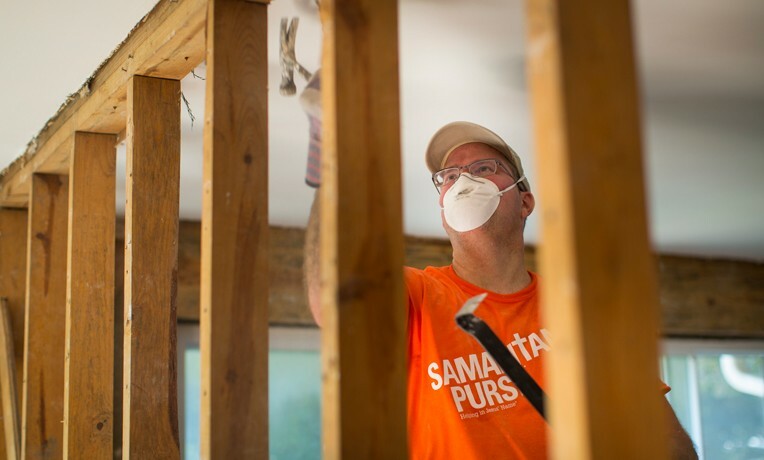 Samaritan’s Purse deployed a disaster relief unit from North Carolina to Hays County, Texas, on Monday to help homeowners affected by the floods. By Tuesday the team had already received more than 100 work order requests. 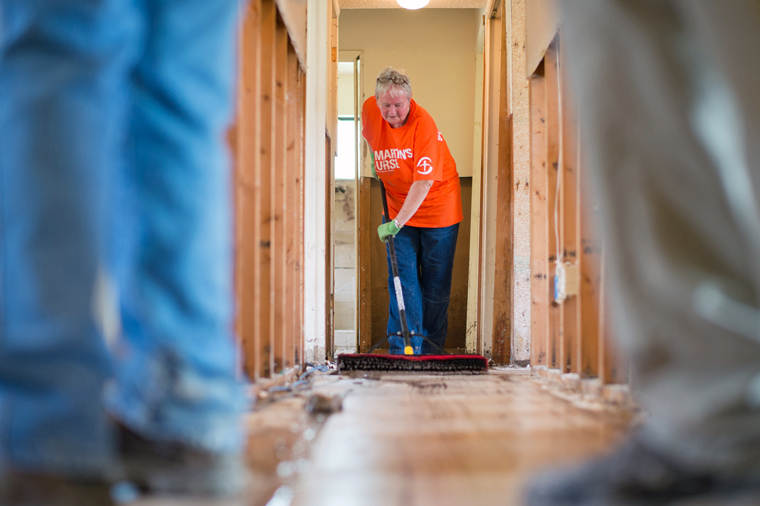 Promiseland Church in San Marcos offered its facility as a base of operations for Samaritan’s Purse staff and volunteers, and on Wednesday we began to assist storm victims with mudouts and the difficult task of removing their waterlogged belongings. Church member Mike Hollifield eagerly signed up to volunteer. His wife is a cousin of the Hernandezes. All day Wednesday Hollifield and seven other volunteers worked side by side with the Hernandez children and their spouses to remove mud-caked furniture, ruined electrical appliances, mattresses, and clothing from the house. They tore out soaked insulation and sheetrock. During the next two days volunteers will be ripping out tile flooring. 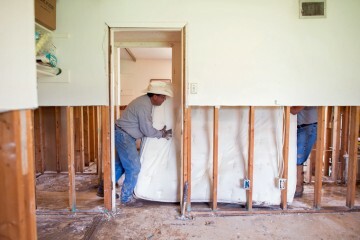 Volunteers have come from near and far to help families affected by the flooding. While most of the volunteers were local, some came from as far away as South Carolina and New York to help. Cande, 83, and Camilla, who will turn 80 in July, watched the proceedings with contained emotion. They have experienced hard times in a variety of forms over the years. Even in their current loss they expressed gratitude to God for sparing their lives and sending them kind-hearted helpers. Family members helped remove ruined belongings from the house. Despite their material losses, they know they are immeasurably blessed with a close-knit family and supportive friends. 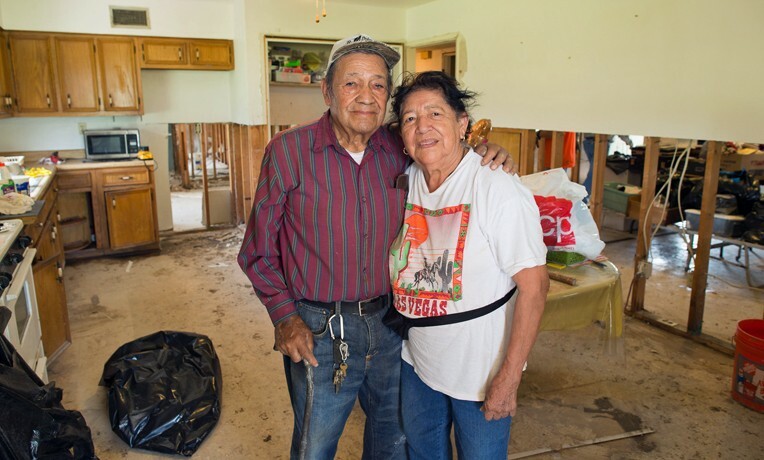 Even a flood—as disastrous as it is—cannot shake the real foundations of their lives or their enduring love for one another. The Hernandez children, their children’s spouses, and grandchildren have taken on the most painful assignment of carrying out armload after armload of damaged belongings from the house. Some of those items hold sentimental meaning to them too. One son, Thomas, was determined to clean the mud off of a framed aerial view of the farm that he gave to his parents several years ago. After some scrubbing, he was relieved to see that the picture was salvageable. Cande and Camilla are staying with relatives in San Marcos until their house is completely mudded out and repaired. Their children insist that the date they return to their home of 34 years is a question of when, not if.